Enamel paint provides a resilient surface for high-traffic areas. While enamel paint's durability is an asset, it also makes it difficult to clean up paint accidents. Protecting the floors, furniture and yourself will help prevent unintentional enamel paint exposure. Unlike latex paint, enamel paint will not easily wash off your skin with soap and water. Luckily, some cleaning agents are safe for your skin and effective at removing enamel paint. 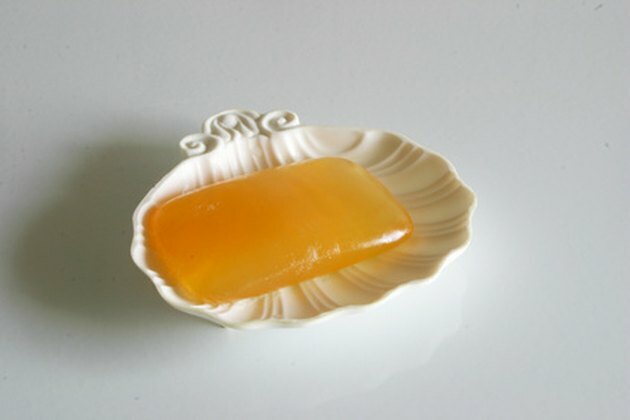 Glycerin soap helps remove enamel paint from skin. Wipe your hands off on a rag as soon as you notice any spots of enamel paint. Remove any paint that is still wet. Rub vegetable or mineral oil on your hands to loosen paint. Continue to wipe off your hands on a rag as the oil dilutes the paint. Use an abrasive sponge to gently rub tough stains. Be careful not to cause any damage to your skin. Wash your hands with glycerin soap and water. Continue to lather and rinse until all traces of oil are gone. Apply a small amount of mineral spirits to a rag. Gently rub on stubborn enamel paint stains. Wash your hands immediately with soap and water.